Product information "HAIX Protector Ultra Lime Green, FS"
If you make a living working with a chainsaw, you want to control your risk and protect your safety. While protection and safety should be at the top of your list when choosing chainsaw protective footwear, you also need to have steel toe logger boots that will be functional so that you can do the job at hand. 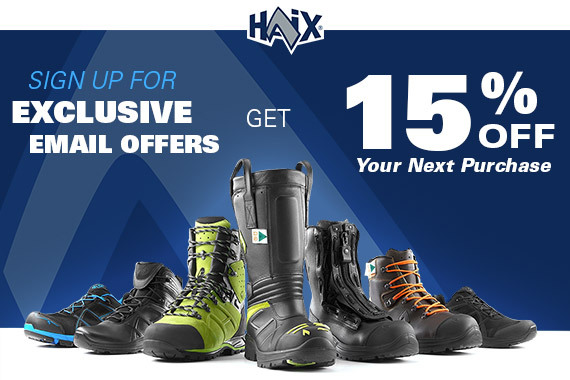 Whether you work at heights or on the ground, these Factory Seconds HAIX forestry boots provide both maximum comfort and a higher level of cut protection. Offering European Class 2 (24m/s) cut protection, these steel toe logger boots are impressively stable and surprisingly lightweight and comfortable. And the lime green color gives you a higher degree of visibility and a better sense of where your foot is in relation to the chainsaw. Combine the lime green color with the silver reflective elements at the side and back of the boot, and you get a visibility boost day or night. These Factory Seconds HAIX forestry boots are designed with attention to even the smallest detail. The suede leather is built with minimal seaming and double stitched in order to reduce the possibility of seam failure out on a job. A soft, close fitting sleeve in the boot and the combination of leather and suede on the tongue allows for a closer fit that will prevent wood chips and debris from getting into your boot. In addition, the two zone lacing permits independent lacing of the upper and lower part of the boot in order to provide a fit tailored to your individual preferences. Pair the lacing with roller ball style eyelets and lacing becomes a breeze. The breathable European sourced leather of these Factory Seconds HAIX forestry boots, combined with a waterproof GORE-TEX® inner lining, ensure your feet stay dry and comfortable all day out in the field. The built in Climate System carries moist air out of the boot through vent holes at the side and on the tongue. The Climate System helps your feet maintain a comfortable temperature whether working in cold or warm weather. HAIX® recommends a good wool blend sock as a wool blend is better able to work in conjunction with the climate system, wicking away moisture and keeping your feet drier. And the adjustable lacing allows you the ability to be flexible in your choice of socks, whether it be a thicker sock for cold conditions or a thinner sock for warm conditions. These steel toe logger boots are built to orthopedic criteria and help to promote foot health. Built in ankle protection and support keeps your delicate ankle area safe and secure; so important in preventing ankle injuries. The Vibram® hiking sole gives you extra grip and slip resistance to keep you on your feet even in colder temperatures. Related links to "HAIX Protector Ultra Lime Green, FS"
Our comment on "HAIX Protector Ultra Lime Green, FS"
Customer reviews for "HAIX Protector Ultra Lime Green, FS"